It would seem that not only is someone at Zynga is a Doctor Who fan, but he or she has decided to make things just a teensy bit more "interesting" for the trailblazing pioneers of FrontierVille. Blink and you're dead. They are fast, faster than you could believe. 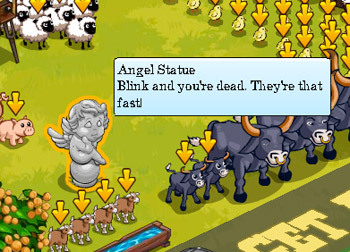 Don't turn your back, don't look away, and don't blink. The description is a reference to The Weeping Angels, which first appeared during sci fi series Dr. Who's third season in the award-winning episode "Blink." They are a predatory species that feasts on energy, and they're particularly fond of the life energy of another being. The Angels have a unique defense mechanism which turns them into simple statues it any living creature is looking at them. The moment the lights go out, however, they move with incredible speed, crossing entire rooms in literally the blink of an eye. Obviously, no one's in any real danger from this particular angel statue; it's just a fun joke for fans of British sci-fi to discover. But just in case, I'd avoid looking too closely at the statue's eyes. Trust me on this one; I'm doing you a favor.